EBWatts was born in New York City in 1940 into a family of professional artists. Her masterful vision of balance, colour and vital, fluid energy stems from the collage of patterns and rhythms which she experienced in her childhood. Her art is unmistakable and instantly recognisable amongst connoisseurs. Her repertoire is praised for its abstract resonance and surprisingly harmonious synergy between subject and object. 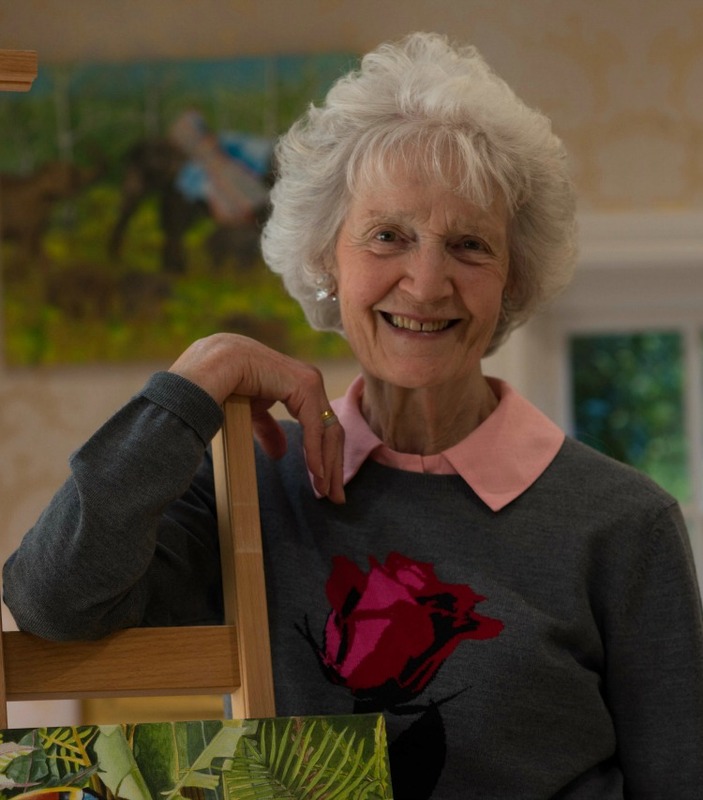 Over the last 65 years EBWatts has developed a distinctive body of work full of mysterious charm and transcendent wonder, colourful complexity and hide-away humour which has set out to challenge and expand modern conventions of subject matter and settings in art. Each painting is carefully planned and arranged across the blank page of the canvas hinting at how her way of life has a conscious effect on where she goes and what she sees on her travels abroad and at home. Her studio is an eclectic collection of treasured objects from the far corners of the world which she drew from her childhood and throughout her adult life. In 1962 she had her first successful exhibition at the age of 22 in Far Hills, New Jersey with others to follow. From 1970 to 1985 she exhibited with Andras Kalman at Crane Arts and the Crane Gallery, Sloane Street, London. In the 1990’s she exhibited at Manchester’s Art House in Manchester, UK. For her most recent work please visit the ‘New Gallery’. Watching sheep in sleighs relax. And speckled shells from foreign lands. Sleeping cats and gold fish dreams. Red, white and blue for celebrations. Where writers write and dancers dance. She is, of course – the artist.